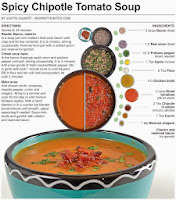 Tomato soup was always my favorite canned variety growing up. I loved to let it cool a little, then crumble a few saltine crackers into the bowl, stir it up, then gulp it down like a pledge at a fraternity party. 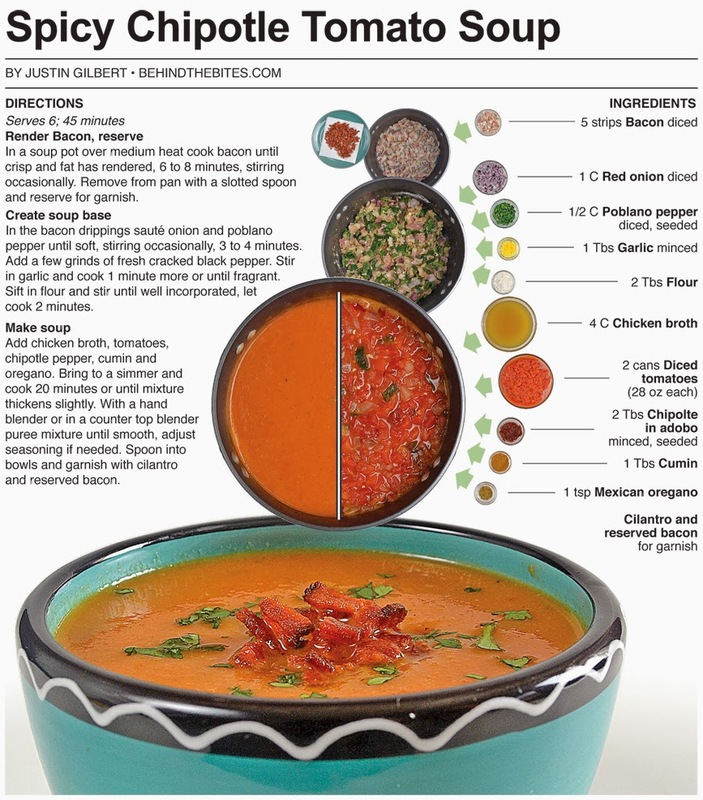 Today, I can’t really say tomato is my favorite soup, because soup in general is one of my favorite things to make regardless of variety. I rarely eat the canned stuff anymore, because homemade soups are so much tastier. I use canned soup mainly as an ingredient in other recipes. 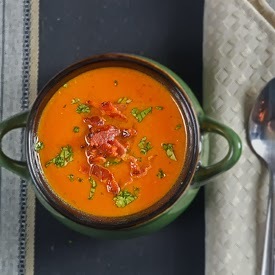 When I make tomato soup I like to start with bacon, the two seem to work well together and it’s a great flavor to build upon in general. I also like it spicy and blended into a smooth texture, which makes it the perfect compliment to a creamy grilled cheese. 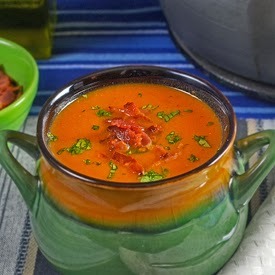 For this tomato soup, I use chipotle pepper for a smoky and spicy boost to the bacon. It also features poblano pepper, cumin and Mexican oregano to give the final product a South of the border zing. As soon as I took the first taste of this I knew I had to throw together a grilled cheese to serve along side it. I originally planned to make the soup alone but the spiciness screamed for balance and when it comes to tomato soup there is no better compliment than a gooey grilled cheese! This soup featured poblano peppers in the mirepoix to add a little zestiness. In my experience poblano is generally a mild pepper, but about 1 out of 10 seems to have the kick of a much hotter pepper. Well, as luck would have it, one of the poblanos in this batch was hellfire hot, therefore making this soup on the higher end of the spice scale. The chipotle added a decent amount of heat by itself, the addition of a tongue blistering freak from the poblano family made me reluctant to share this without the grilled cheese – by itself it was hot enough to make my nose run. A Southwest grilled cheese that I busted out to go along side this soup made for the perfect balance. Look for it in my next post. In a soup pot over medium heat cook bacon until crisp and fat has rendered, 6 to 8 minutes, stirring occasionally. Remove from pan with a slotted spoon and reserve for garnish. In the bacon drippings sauté onion and poblano pepper until soft, stirring occasionally, 3 to 4 minutes. Add a few grinds of fresh cracked black pepper. Stir in garlic and cook 1 minute more or until fragrant. Sift in flour and stir until well incorporated, let cook 2 minutes. Add chicken broth, tomatoes, chipotle pepper, cumin and oregano. Bring to a simmer and cook 20 minutes or until mixture thickens slightly. 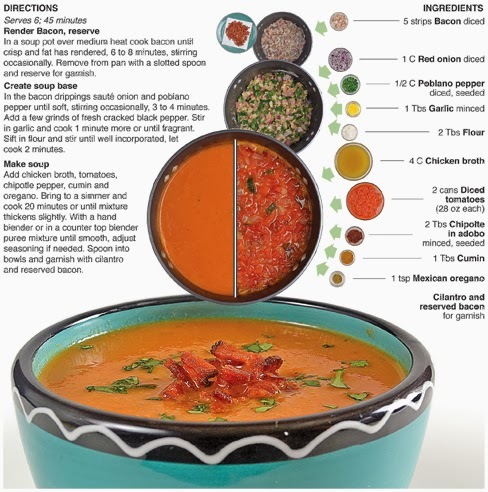 With a hand blender or in a counter top blender puree mixture until smooth, adjust seasoning if needed. Spoon into bowls and garnish with cilantro and reserved bacon.